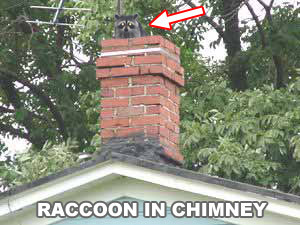 Sometimes wild animals will live inside the chimneys of homes. Sometimes they are merely exploring, and they accidentally fall down. If the damper is open, the animal will come right into the house! We've dealt with a few cases of squirrels on the loose, because they came down like Santa Claus. A chimney is like a big hollow tree, so of course wild animals will try to make a home there. If you have a squirrel in the chimney, it's probably living there, because squirrels are great climbers. Same goes for a raccoon in the chimney. Bats and birds also live in chimneys. We safely remove these critters, and install a professional chimney cap to prevent it from happening again.